Peanut Gallery presents ‘Morbid Curiosities’, an exhibition of eight artists from around the world, curated by Fruzsi Kenez. 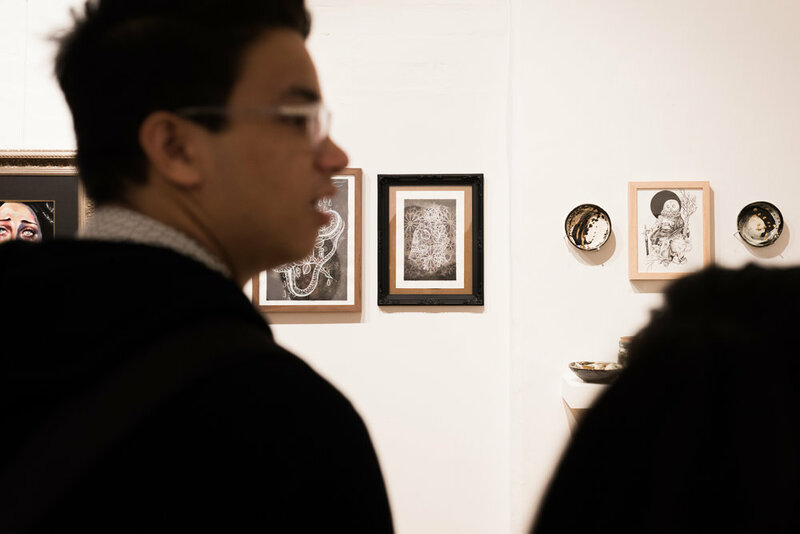 Playing on the traditional notion of ‘The Wunderkammer’, the show explores all things bizarre, anatomical and macabre. 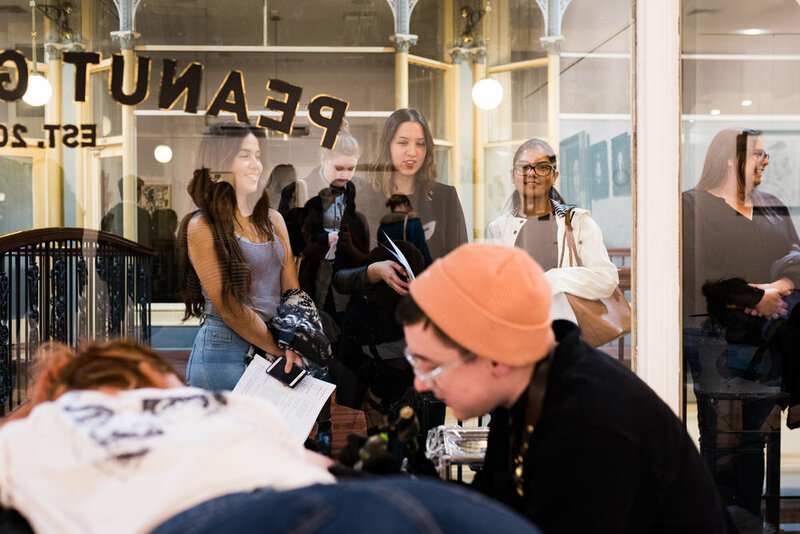 This exhibition boasts artists from Russia, America, Ukraine and Australia and features a very unique collaboration between an illustrator and a tattooer, resulting in a ‘flash’ style tattoo event on the opening night. One of the inspirations behind this exhibition is the work of Russian duo Rotten Fantom, comprised of Elena Snegotckaia and Vladimir Snegotskii from Moscow, Russia. They utilize dotwork techniques to create surreal, mystical black and white drawings. The chief idea driving their practice is a fascination with the natural forces’ never-ending cycle of decay and resurrection. They explore the borders between life and death and mystic sacrifice. The attention to detail in their work is incredible. Based in Odessa in Ukraine, Dasha Pliska’s work is steeped in tales of the oldest legends and mythologies. She presents drawings of bird-like creatures that haunt the night and reoccur in Slavic folklore. In addition, she creates meticulous graphite drawings on tracing paper of fierce women with symbols steeped in the occult. 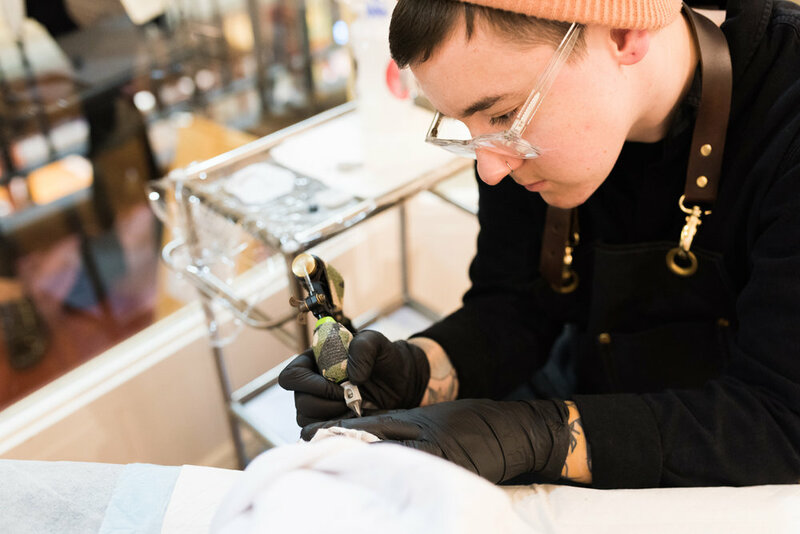 Similarly, Adelaide-based tattooer Parker Lyas is interested in symbolism and the significance of signs. His work carries trademark elements of heavy contrast, patterns, layers and texture. He explores the balance between darkness and light and creates bold geometry-based tattoos with intricate details. 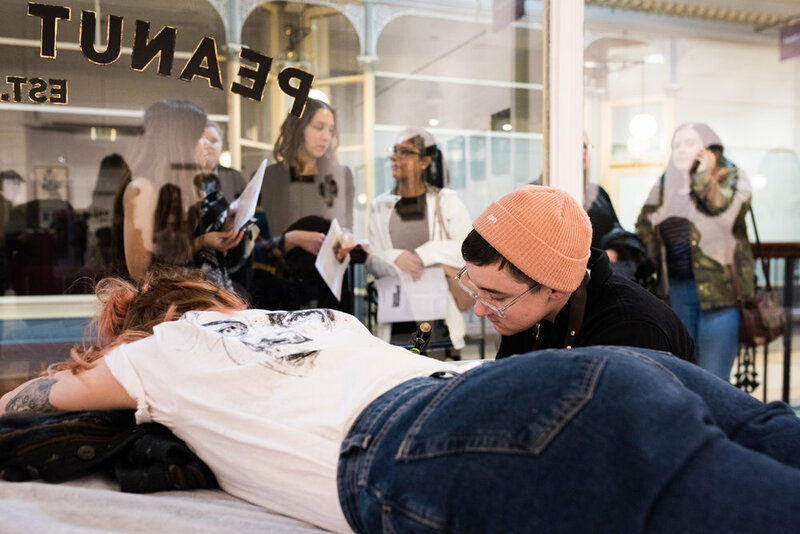 He has created three original ink and pen pieces for this exhibition and paired up with illustrator Fruzsi Kenez to present a unique tattooing experience on the opening night. He is found working full-time at Progression Tattoo on Unley Road. Ally Burke esides in Virginia in the Appalachian Mountains, and creates work that is heavily inspired by nature, folklore and in her own words, ‘cosmic weirdness’. She has continued to explore these themes in her creation of work for Morbid Curiosities, with a particular emphasis on spiritualism and occultic esoterica. She has an impressive online following, and Peanut Gallery is honored to have her create four original pieces for this exhibition. Tessa Hancock is an Adelaide-based tattooer originally from New Zealand. She works full time at Progression Tattoo, specializing in black and grey realism. 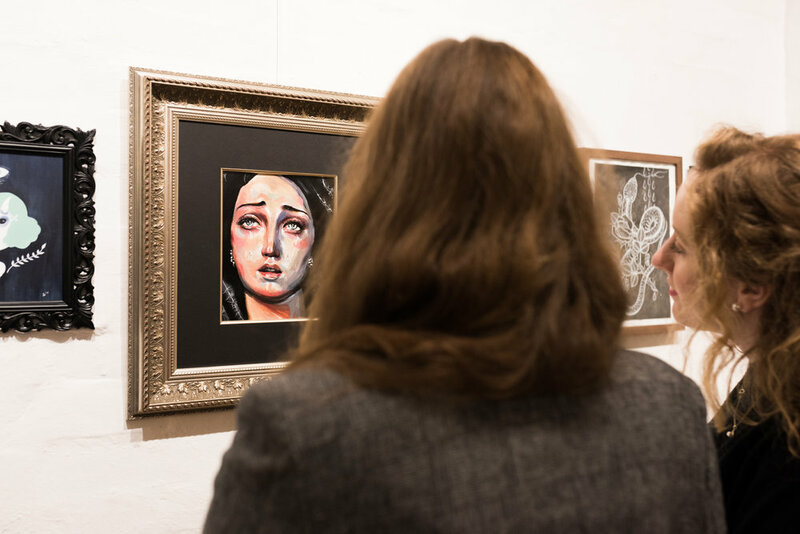 Her signature subject matter is female portraiture which she continues in her original painting exhibited in this exhibition. She was particularly inspired by Central American statues of the Virgin Mary, and chose to depict her in a contemporary guise, focusing on the emotion and the moment of struggle. Similarly, Fruzsi Kenez has had a long-held interest in religious iconography and the idea of ‘the sacred object’. She has translated this idea into the ceramic medium, capturing a balance of vulnerability and darkness. She fuses familiar domestic forms with fragments and jagged elements to imply a sort of inorganic crystallisation over time. The use of lustre adds a sense of value and purpose, seeping out in an impossibly organic way. 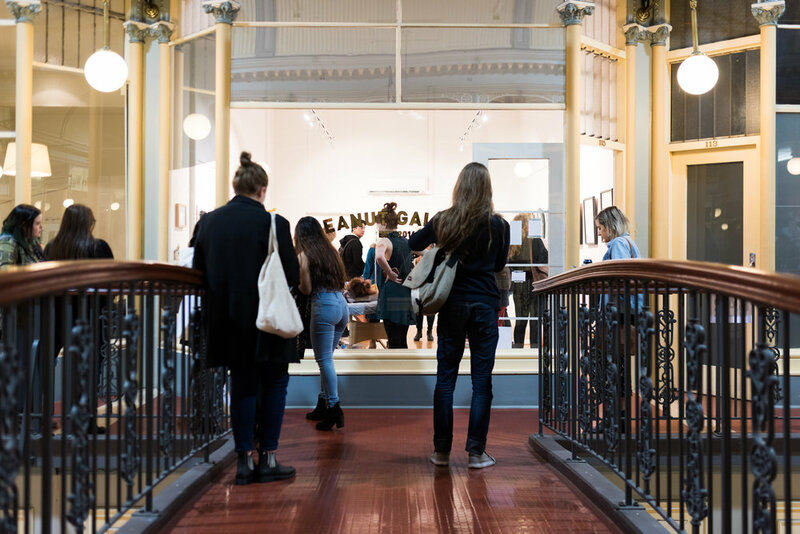 Emma Sullivan is a returning Peanut Gallery favourite, known for her ‘Oozy Burl’ series exhibited in Creepy/Cute. Acrylic paint, aerosol, resin, expanding foam and clay are the base ingredients for her extra-terrestrial creations which appear to shift, move and expand before the viewer’s eyes. Titles like Sabre Tooth, Ghost Man and Sparkle Tongue tantalise the viewer into a world of their own imagination. In her words, this macabre yet whimsical series exists in the place where delight meets disgust and imaginary creatures come out to play. Fiona Roberts is an Adelaide-based multi-disciplinary artist. Themes central to her work include the home and the body, which she describes as ‘palimpsests of life events with their history inscribed into every surface.’ The subjective nature of the home is explored through a variety of body textures that are obscured by pattern, repetition, and traditional ornamentation in household furnishings. Pieces like ‘Spilt’ blur the boundaries between the home and body, inviting viewers to contemplate their relationship with everyday objects and the energies that move around them.